Drought was setting at the church which had once been home to several high-caliber leaders, such as Herschel Rice and Dean Schield. Numbers had dwindled to thirty on a good Sunday, and a clear vision for the future didn’t exist. New direction was needed to make Oak Park Community Church of Claremont, California (formerly First Church, Pomona) the beacon of hope it once was. Under the pastoral leadership of Jeff Combs, could the congregation again become a wellspring of Living Water? Signs of life in the desert suggest an Oasis is on the horizon. From the time Jeff and Kim arrived at the church in October 2015, there was no lack of prayer. They heartily encouraged the congregation to earnestly seek God in personal and corporate times of prayer for direction and renewal. To this day, the prayer team that they formed early in the process continues to meet every Tuesday morning at 10:00. Jeff emphasized the need for prayer in his sermons, and credits the present turnaround to prayer. 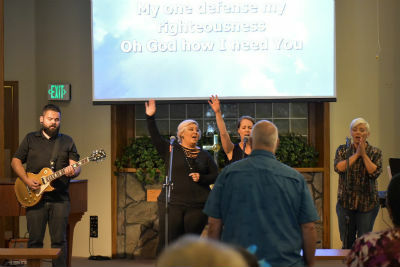 “As I sought godly counsel from various sources, each person told me that the most important thing we had to do for success was pray.” Instead of trying harder, or seeking first the latest advice from church growth experts, Jeff and Kim led their congregation to seek the face of the Lord above all else. It seems to be making a difference. 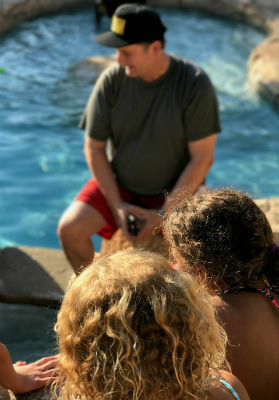 Poolside Bible study, of course! It’s CA! Restarts aren’t for the faint of heart. The legwork can be daunting, whether communicating change effectively, finding or reallocating investments and resources, or navigating fluctuation in attendance and volunteers. But consistent and devoted times of prayer kept Jeff and his growing leadership team focused away from the distractions and on the subject. After all, Jesus is the only real thirst-quencher! For the parched soul, the weary-worn traveler, and desperately searching—this Oasis in the desert is no mirage. In southern California, across the United States, and around the world, God is on the move in the Church of God. Join the movement. Reach our world. Donate today at give.jesusisthesubject.org. This entry was posted in All Church of God, Western and tagged CA, church planting, church restart, Claremont, Jeff Combs, Living Water, mission, Oak Park Community Church of God, Oasis Church of God, Pomona, Rancho Cucamonga, re-start, revitalization, Southern California, turnaround, vision. Bookmark the permalink.